It's the close of a book, the end of the chapter and the story has been told. The Dark Knight Rises is exactly that. The trilogy ends and while it leaves the door cracked in some places it gives you the feeling that the story has been told and is over. I have been waiting for this movie for a long time. My love affair with all things Batman is only rivals by my James Bond allegiance. It is a strong but distance 2nd to Bond but its a story I’ve always loved and enjoyed. So the Skyfall trailer before hand had me squealing like a little girl in my seat. I don't dislike The previous treatments, the camp of Adam West and the Grit or Time Burton's films are som of my favorites for completely different reasons. (I’m pretending Batman & Robin never happened) The movie introduces a villain i knew from watching every single episode of Batman: the Animated Series, Bane. While he doesn't exactly look like the Bane i know or was expecting the idea of him at his core is correct. Bane is intelligent and knows exactly what he is doing at all times. While i totally would have looked forward to the plug in model this is acceptable. Tom Hardy who we only see his full face for a brief moment is carrying the presence of Bane while holding the mood he's supposed to he's a smaller bane but he still has that walk to make you believe you have to listen to him or else. Silena Kyle AKA Catwoman is slick, cunning and well played by Anne Hathaway. Her moments as Catwoman remind me of Julie Newmar, her parts as Silena, the cunning con artist who can make any man fall for her make me feel like they drew on the elements of Poison Ivy from the cartoons. The movie weaves together parts from Batman Begins and The Dark Knight to complete the trilogy, the story of Bane takes you back to Ra's al Ghul and how he trained Bane, yes he even makes an appearance in this and not only from flashbacks. It weaves a story you feel, even though i almost got upset when i thought they were changing canon till i realized it was a purposeful misdirect intended to shock those who don't know Batman but to make those who know the story briefly doubt themselves. While the appearance of Scarecrow was a good enough fit i have no doubt it would have instead been played by Joker had Heath Ledger still been alive. It would have been perfect. The movie takes you on this journey weaving in a overzealous Deputy Commissioner (Matthew Modine) hoping to replace Commissioner Gordon, Gordon himself still wrestling with his guilt and his lies of elevating Harvey Dent to this symbol of true and justice, and Officer Blake (Joseph Gordon-Levitt) smart enough to not only know that Bruce Wayne is Batman but he has a nice little secret of his own i felt about halfway thru and was glad to see it payoff. This movie is not non-stop action and I’d be disappointed if it was. There's a story here that needs to be told and you have to pause and get the drama from, it the interloping angles, the recalls back to the other 2 films to fully understand and appreciate this film. I can't even compare it to the Avengers which i thought was amazeballs because the 2 aren't on the same plane. Its two very different treatments of comic book superheros. They are both off the walls great but for different reasons. I watched this movie in IMAX. The rumbling of the seats, the pictures and sound are all good. I give this movie a full price. You absolutely need to see the first 2 to get the full effect but its completely worth it. It clocks in at close to 3 hours which if you do count trailers they yeah 3 hours. This movie does not stand alone and Christopher Nolan doesn't want to, it weaves so good the only real disappointment was Miranda Tate's death wasn't what i expected but it sure puts a nail in the coffin on on the birth of Damian Wayne. 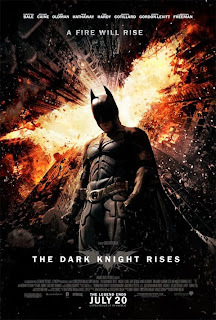 The Dark Knight Rises is rated PG-13.